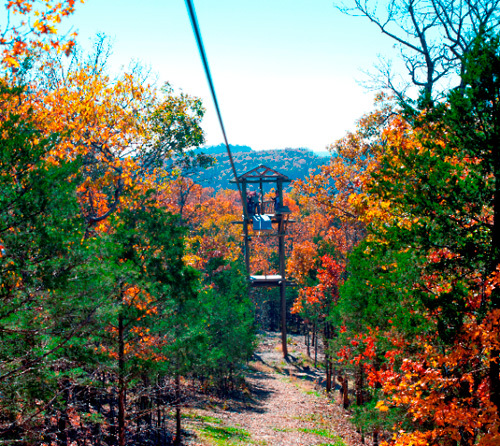 An exciting eco-adventure experience located in the Ozark Mountains, Branson Zipline Canopy Tours at Wolfe Creek Preserve offers safe, highly entertaining zipline and canopy tours for guests of all experience levels. 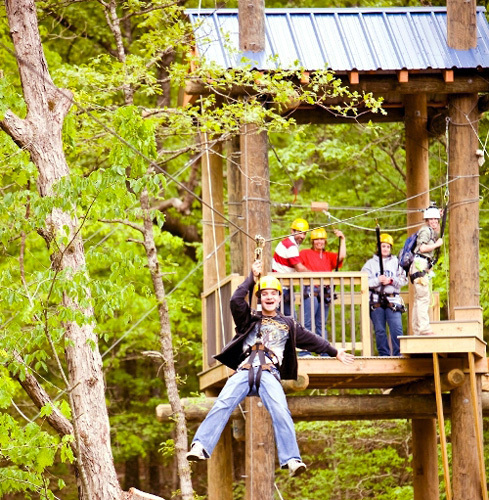 Adventures include the Ozarks Xplorer Zipline Canopy Tour, the Flying Prospector Zipline Canopy Tour, the Blue Streak Fast Line and Free Fall Xpress, and much more. Nestled in the forests and hills of the Ozarks. Only freefall platform in Branson. Short drive north of Branson. Participants must weigh between 70 and 275 lbs. Photos taken during tour available for purchase. 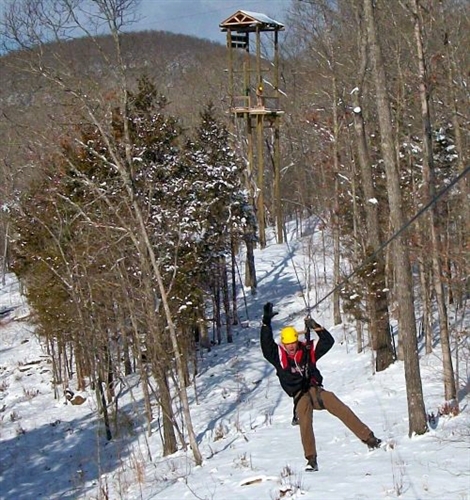 Soar into Adventure with Branson Zipline Canopy Tours at Wolfe Creek Preserve! We are taking eco-adventures to new heights. 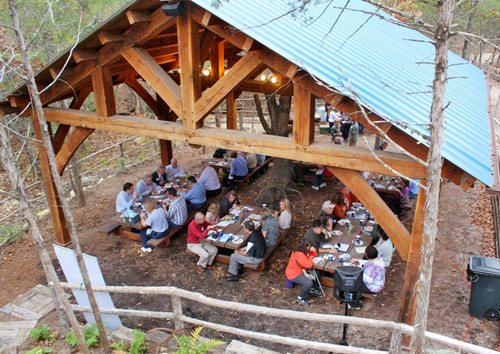 We offer a variety of different experiences in the Pristine Ozark Mountains. 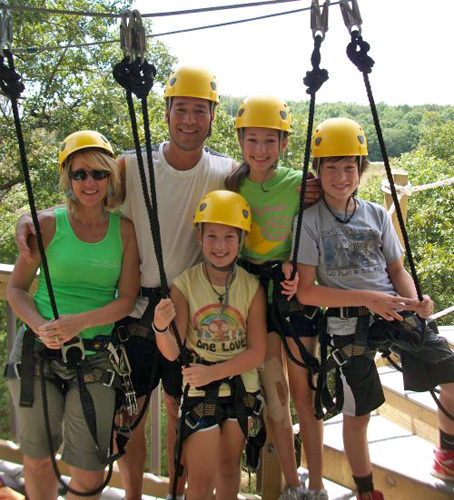 Ozarks Xplorer Zipline Canopy Tour: One of the best eco-adventures in North America. 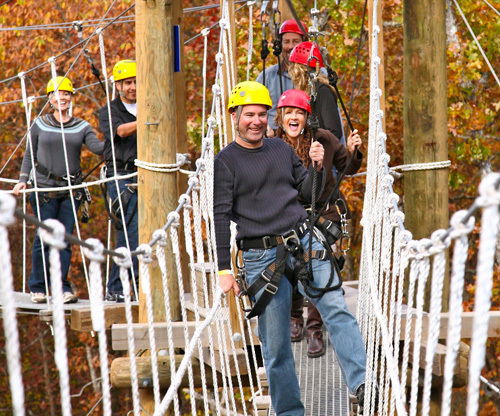 This is an immersive experience, during which guests take in the ecology of the Ozarks while traversing over multiple ziplines and skybridges. 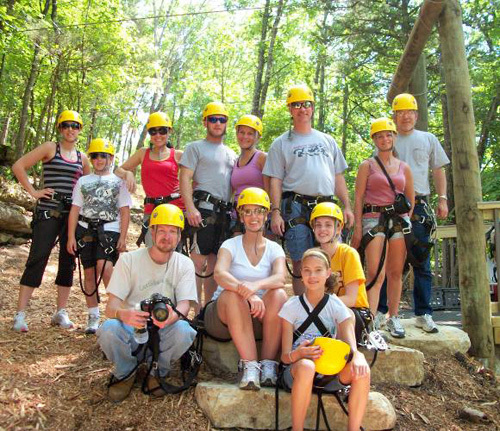 During this 2 ½ hour guided experience visitors enjoy zipping through and above the trees, alongside rock bluffs and above the forest fauna. 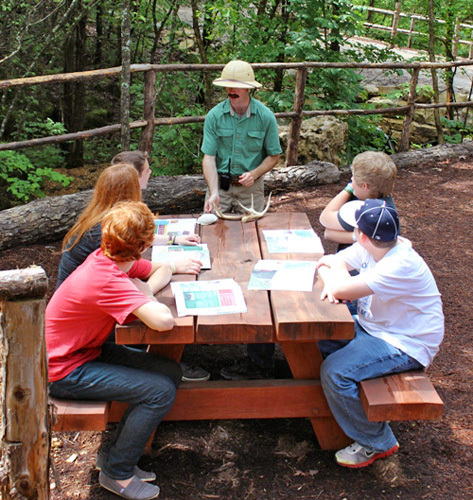 Certified guides provide a safe and interesting experience while sharing many of the secrets of Wolfe Creek Preserve. Tour includes seven ziplines and 10 skybridges. Flying Prospector Zipline Canopy Tour: At 1 and ½ hours this tour is perfect for the visitor wanting to dip their toes into the world of ziplines. Designed for all ages, this one of a kind tour gives visitors a high-quality, low-impact adventure. Certified guides travel with you as you discover the features of Wolfe Creek Preserve. Tour includes four ziplines and seven skybridges. Blue Streak Fast Line and Free Fall Xpress: A breath taking plunge from the top of Wolfe Creek Preserve, this is the ultimate in thrill-seeking entertainment. You’ll experience a soaring flight down the mountainside with an amazing freefall dismount from Everest Tower. It is truly an unforgettable experience. Branson Zipline Canopy Tours is a member of the Association for Challenge Course Technology (ACCT). The design, construction, and inspections meet or exceed ACCT standards. All of our guides are safety certified. Wolfe Creek Photo Safari Guided Walking Tour is a gentle, downhill walking tour where guides provide historical, ecological, and topographical information as well as share the legend of Eli, Sarah, and Issac Wolfe. The tour includes a snack break and unique glimpses of the zipliners. It is also the only tour where photography is allowed. 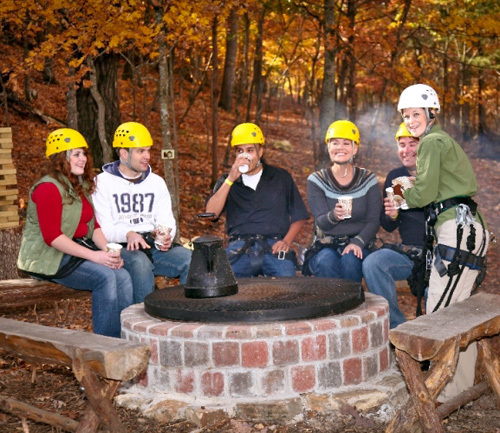 This is a perfect eco-adventure in the Ozark woods for those who may not be ready for a canopy tour. All tours include a ride in the Wolfe Creek Safari authentic Pinzgauer, a Swiss Army Troop Carrier. 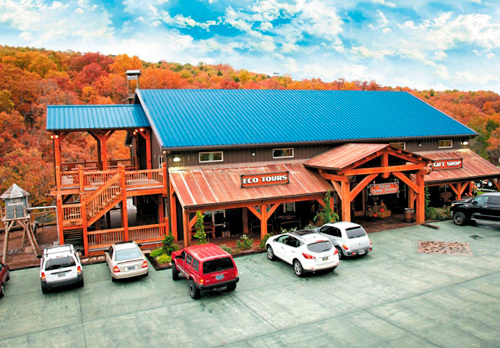 Branson Zipline Canopy Tours at Wolfe Creek Preserve is located on US 65 Hwy, 7 miles north of Branson theaters, shows, and attractions. 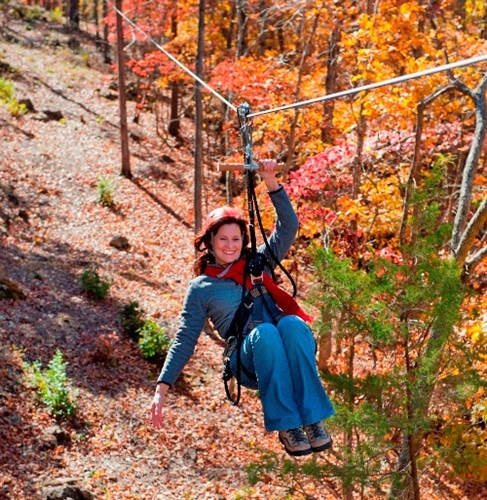 How long do the zipline tours last at Branson Zipline? Additionally, plan on arriving at least 30 minutes prior to your scheduled tour time to allow for check-in. 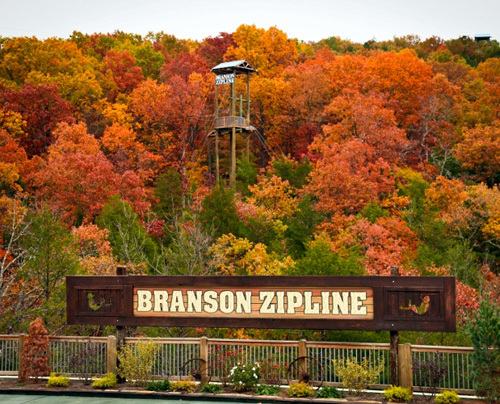 How long are the courses at Branson Zipline zip line and canopy courses? In total, the zipline and canopy course at Wolfe Creek Preserve features over one mile of zip lines, as well as numerous suspension bridges and walkways. 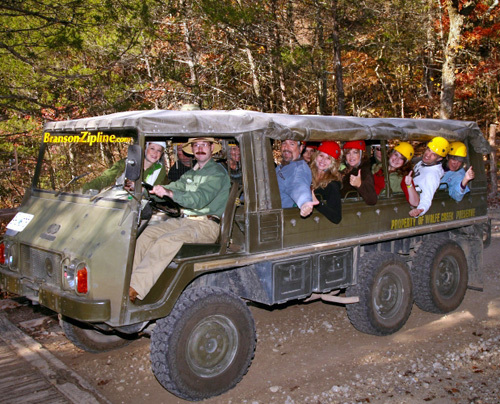 For all tours featured along the course, you will enjoy a ride to the top of Wolfe Mountain in a Pinzgauer Swiss Army troop carrier and then descend down the route outlined for your particular zip line and canopy tour. Guests should wear comfortable clothing that is appropriate for physical activity, such as short sleeve or long sleeve T-shirts and shorts or long pants. Clothing such as swimsuits and dresses are not recommended. All riders must wear closed shoes or closed toe sandals that are strapped on. No loose shoes of any kind are permitted! Riders with long hair are advised to wear their hair in a ponytail, and riders should avoid wearing dangly jewelry. If you forget any of the above appropriate clothing items, we have them available for sale in our gift shop. We also advise guests to wear layers in case of cool or inclement weather. 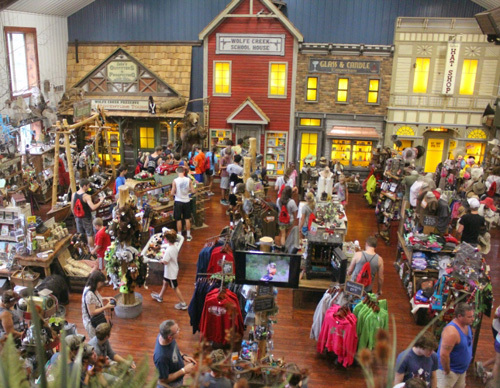 Is Branson Zipline associated with any industry organizations? Yes. Branson Zipline was built by an Association for Challenge Course Technology (ACCT) - certified contractor and its guides are course certified. 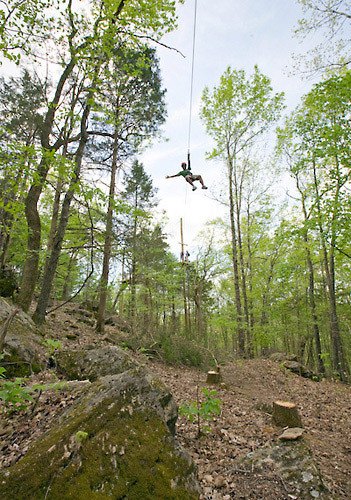 How much physical effort is involved in the tours at Branson Zipline? We have designed this tour to require minimal physical exertion and to be fun for all ages. There are a few steps and some walking involved. But, if you are capable of walking at the mall, you will be able to enjoy this tour. Due to safety concerns we can not allow anyone who is pregnant to participate on any of our tours. 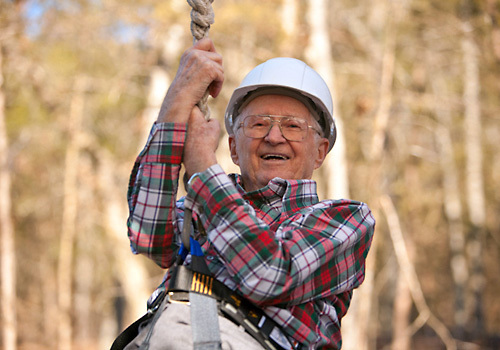 If you have pre-existing health conditions that impair your physical activity you may want to check with your physician before participating in any of the tours offered by Branson Zipline. We can easily accommodate any age so long as the participant meets our minimum eligibility requirements. However, due to safety concerns all participants must weigh between 70 - 275 pounds. We do operate rain or shine, sleet or snow. Typically, we only close the property due to lightening. What kind of training do your guides receive? All guides are course-certified to ACCT standards. What if I have never done a zipline tour before? No experience is required. Our patient guides will help you have the best possible experience. Yes, it is required that you sign a waiver similar to any other you may sign to participate in a physical activity. For the safety of all of our guests and guides, cameras are NOT allowed on any Zipline tour. Your guides will take photographs which will be available for purchase at the conclusion of your tour. Cameras ARE welcome on the Wolfe Creek Photo Safari Tour, which is a ground based tour. What steps have been taken to mitigate danger? 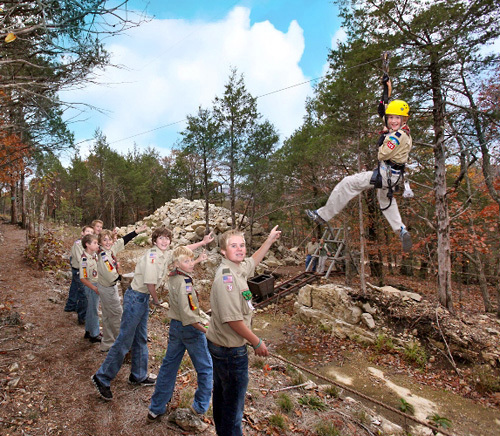 The zip line course at Branson Zipline were designed and built by an Association for Challenge Course Technology (ACCT) - certified builder. The ACCT is the leading U.S. organization that sets safety standards for zip line tours and has been accredited by the American National Standards Institute (ANSI).